This post will first address the question of the inverter’s capability of handling excess power. Next, we will see what Australian regulations have to say about the practice of oversizing, and what happens when the regulations are broken. Finally, we will see if it a good idea in your situation to supersize your solar. Inverter manufacturers publish maximum input capacity on their specification. This is often stated in volts and amps rather than watts. SMA, for example, document an extremely conservative maximum input, but on calling their tech support team, this limit is increased, and they can send supporting documentation. In short, all inverters worth their salt can handle input power much greater than an electrician would ever attempt to connect. The reason for the electrician’s conservative approach is Australian regulations. The success of solar in Australia is due to the federal government’s Renewable Energy Credits programme. The credits are paid proportionally to the amount of renewable energy a system will produce, or more importantly, the amount of carbon it will offset in a 15 year period. A 6.5kW solar system will attract a financial incentive of about $5000 under this programme. Strict regulations mandate the way systems are to be installed to ensure this program is successful. The Clean Energy Council are the body that is responsible for developing standard and regulations that promote renewable energy. The clear thinking folk at the Clean Energy Council realize that a 5kW of solar panels will only operate at 5000w when the sun shines at a 90-degree angle to the panels, the temperature is 25 degrees, and there is 1000w of irradiation: or hardly ever. So to get reasonable use out of your inverter, it’s wise to oversize. By by how much? The CEC surmised that the panel capacity should be no more than 33 percent of the nominal output of the inverter before your panel’s production starts getting wasted, and the Renewable Energy Credit payout is misused. So why not just get a 6kW inverter? If your home (like the majority of households) run on single phase, Energex will only approve inverters up to 5kW. If you have 3 phase at home, we can submit an application to Energex for a large system. It takes a few months to process and they may or may not approve it. Additionally, because 5kW and 10kW inverters are the most common size used, inverters within this range a un-proportionally expensive. You may notice I have mentioned nominal output and maximum output. What’s the difference? Maximum output is what your inverter will output on a perfect day (within tolerance). Most 5kW inverters have a maximum output of 500W. If you oversize your solar panel array, it’s not unusual that a 5000w inverter would reach 5100w. Nominal output – for all intents and purposes – is a joke. It’s just what the inverter manufacturer decides to label the inverter to meet particular power authority thresholds. A common nominal output thanks to the solar giant SMA, is Germany’s regulated 4.6kW, even though the inverter will easily run at 5000W. This is important because the CEC only allows a system to be oversized by 33 percent of the nominal output. This means the German made SMA 5kW inverter, and all who followed in its footsteps, are limited to 1.33 x 4.6kw = 6.118kW. On the other hand, inverters such as the SolarEdge have a full 5.0kW nominal output. These inverters can handle 6.6kW of panels, giving you 500W more bang for your buck. It’s this annoying little “nominal output” figure that has left many companies like Appolo Solar red-faced. Recently they were advertising 6.5kW of panels on a Sungrow 5kW inverter with a 4.6kw nominal output. Technically they cannot claim the $5000 renewable energy credits on these jobs – but many companies do! The Clean Energy Regulator and Clean Energy Council are aware of this neglect by what is commonly uninformed solar sales companies. The CER and CEC are currently working on methods to catch and enforce this regulation. They will catch up with the many companies that are “fraudulently” claiming STC’s. It will come back to bite the company who sells the system and customer. At very least, the extra panels will have to be removed, and the STC’s that were claimed under the customer’s name would have to be paid back. It could get messy. So the Inverter manufacturer is ok with you oversizing your panel array, and if done to their guidelines, the Clean Energy Council consider it to be financially responsible. But do I need such a big system on my roof? The short answer is if you have an electric hot water system or pool, or your bill is over $500 a quarter – a 6.5kW system is often what we will recommend. I’ll explain this further in my next blog. Hi Syd. The spec sheet I see says the max DC power is 5200W, however, there may be an updated spec sheet. It is possible the installers wired the panels wrong (paralleling strings) causing the current run too hight and heat up the inverter. However, inverters often do run hot. If you can actually touch it, it may just be what solax inverters do. They are on the cheaper end of inverters. Hi, I have just had a 6.6 KW system installed with a Solax power Inverter, model X1-5.0-T-N with 300 W Csun monocrystalline panels. Since from day one after the commissioning of the system within 4/5 hours, you can put your hand on the Inverter any where, as it is really hot. Is this Inverter big enough in KW’s to run a 6.6 KW system, from what I can find, I don’t think so. I would appreciate your advice and recommendations. TKS Syd STARR. Hi Danny, In Brisbane, you definitely would get clipping, in southern states probably not. If in doubt, upgrade to a 12.5 Fronius Symo. Hi Mark, Looking at a 13.2kw array - split 6.3kw WNW and 6.9kw ESE. No shading at all. Do you think that I would get any clipping using a 10kw fronius 3 phase inverter? Hi Vanessa.... 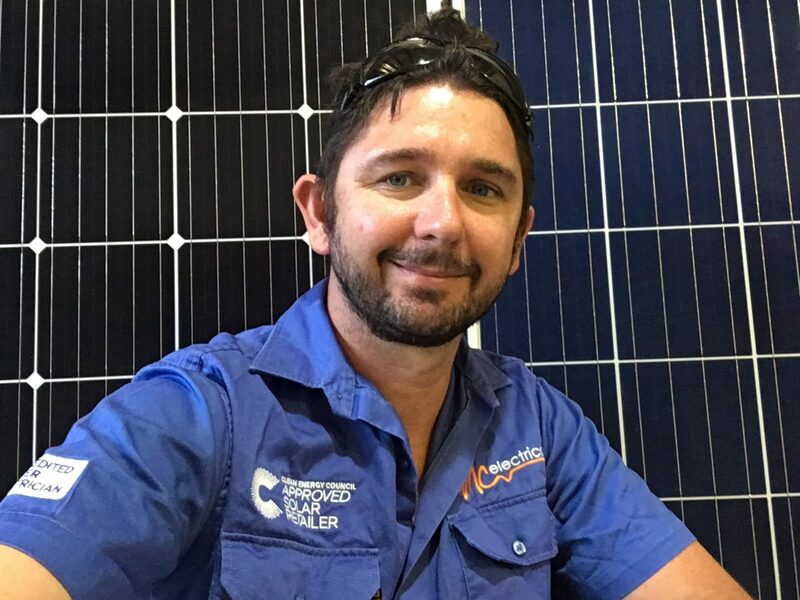 I'll try to give you answers here, but, If you are in SE Qld, call us otherwise we may be able to recommend a good installer.... 1) yes .... 2) yes, as long as you are connected to 3 phase at the house.... 3) In Energex it is approved up to 15kW easily..... 4) unsure what you mean here, probably not :) .... 5)No a 8.2kW Fronius doesn't mean battery ready. 6)Yes and no, unless you use optimisers (read my Tigo blog: mcelectrical.com.au/blog/tigo-energy-solar-panel-optimisers/). 7) Are you in the Energex area? It all depends on your usage and export. We have a calculator for it.... 8) Yes, you can do landscape and portrait together. Hi Ronak, I would usually suggest installing north if possible, and the remainder on the side that is closer to north. Especially because you are in SA. The decision also has to do with the voltage window of the inverter pitch of roof etc. Also, you may need to take into account the feed-in tariff and time of use charges. So more info required, but my first reaction would be to install north. BTW, While 275W panels are about the least efficient panels on the market, at least you can get to the perfect figure of 6.6kW, and it looks like it would be a good stringing design of 16 north and 8 east or west. Hi Mark, I read your blog vary instresting. Currently i plan to install solar panels. As per my house situation , can not install more than 16 panels on one side of roof. I got two options from solar installer as below .So what will be good idea for my case to install 12 panels of 275w 2 side ( north & west ) which will be 6.6kw for 5 kw inverter or have 16 panels on North side which is 4.4 kw for 5 kw inverter. As per solar installer he can't install 16 on North side and 8 on west. Also he suggested 16 on north side is fine. Looking forward for your reply. Hi Peter. You should be able to oversize up to 6.6kW on that inverter, but you have to do it in series with the existing system, so it gets complicated. It depends when your system was installed and how well it was installed as to whether it is worth upgrading. You can't use a Fronius smart meter and relay without a Fronius inverter. Simple advice is don't go with a timer if you can put it on off-peak hot water tariff. And only if you can't do off-peak, consider using Catch power instead of a timer. Catch power is much better than a timer, as it ramps up and down the power that goes to hot water to heat the water only with excess PV. Hi Mark, read this blog entry with interest. I have a 5kW Sungrow inverter attached to my 18 x 270W GCL array. I also have a Quantum heat pump which is on its last legs. I had a couple of things in mind; firstly I was going to try and replace the heat pump with a 160L single element conventional hot water system (I normally do not have a high hot water demand) and attach a Fronius relay and datalogger but apparently it would be incompatible with the Sungrow inverter, so I think I am back to a simple timer, and secondly, I thought about installing another 6 panels on the roof but your comments re oversizing this particular inverter are concerning me. Do you have any simple advice to assist my decision-making? Hi Nathan. Usually, you would be fine with a 5kW inverter. But It's all about the layout of the panels, your present and future load, and if you plan to have batteries in the future. If you are local to us (Brisbane), give us a call and we can talk you through it. 32683836. Hi Josh, I don't think the rated input of the zeversolar inverter is 6.6kW. On their spec sheet the input "dc convertable power" is 5.3kW, so if that is the same as "rated input" then you have already oversized it too far. If not, then yes you would have to pay back the stc's in theory. In Queensland, We can install up to 10kW of inverter if we export limit to 5kW. You should find out if you can do that in WA. Then you just need to install a second system of up to 6.6kW. Hi Ward, Yes, in South East Qld you can do that. We often do an 8.2kW Fronius primo and 10kW of panels. You would want to have a lunchtime base load to make it worth while, but the export would definitely help with the payback now that we can get as much as 17c. Hi Dave, I remember seeing that Appollo add a while ago and I took a screenshot and informed the CEC. If a company cannot work out that much about solar, you wonder what else they are missing. Yeh, it probably will come back and bite them! Hi Owen. Yes, it seems the grid voltage is too high. It would be worth calling your installer to look in the back end of Fronius and see what is happening. They then should be able to contact the network and tap the grid voltage down. Hi Mark, My Fronius datalogger is reporting approx 300 status code 4 reports every month. This is, I presume because the Fronius is clipping the output because the supply is going over 253V. Is this considered a lot? I am considering discussing same with my wholesaler. Hi Joe, yes that's correct BUT.. why install ABB?! Read my recent ABB blog. It's just an ok inverter. I'd go for Fronius any day of the week, if, for no other reason, ABB does not yet have consumption monitoring. Hi Mark, Nice blog, Reading your blog it looks like this System I was quoted on looks all okay 25 x 265 Watt Solar Panels = 6.625KW On a 5KW ABB Inverter. 1.33 x 5000 = 6.650KW So I'm below the cut off, this is correct for the ABB inverter isn't it? Hi Robert. You can only install 1.33 times the NOMINAL OUTPUT of the inverter, which you have said it seems is 4.6. That means about 6.13 max. What is the Germany model inverter? Either an old SMA, or they are using that old "GERMAN INVERTER" sales lie. The "Clean Energy Regulator" should be onto this. If you send the quote to me, I'll send it on for you. mark@mcelectrical.com.au. Hi James, The Fronius 5kW international inverter is a full 5kW nominal output. ("the Australian" model of the Fronius is only 4.6 nominal.) (The Fronius 5kW international is approved for use in Australia). And yes, you could go a Fronius 6kW Prom, or even an 8.2kW Primo and limit the export in Energex. Hi Rosco, It is the responsibility of the installer to ensure your voltage-rise is not above 2 percent. This can be done by ensuring inverter AC cable and mains cable are big enough. If you are on acreage, or your inverter is a long way from the switchboard, then the installer may have failed. It's up to Energex/Ergon to keep it below 253 volts. Measuring once and saying it is 253volts is a joke. Energex always does this - but they know too well that voltage fluctuates and it's too hard for them to fix it. When this happens to us I just keep on putting voltage complaints into Energex until they do the job properly and log the voltage over several days, then eventually tap the voltage down. But the simpler (and more expensive way) is to change your inverter to a 3 phase inverter like you mentioned. If there is a problem after that it is almost certainly Energex's issue. BTW, the Fronius SYMO is definitely the best inverter to handle higher voltage. Hi Mark 12 months ago I had a 6.5kw system with a 5kw Sonius Primo Inverter. From day 2 I have had a 567 problem which as you know throttles the system. Repeated calls to the installer (a large company) got me nowhere all they would/could do for me was to write a Latent Condition to give to Energex, Energex came out and measured the power back to the house at 253kv which is what they say is the legal requirement. But they noted that I have 3 phase power and that the installer should get the power from the inverter onto another phase. They wondered why the installer didn't get me to go for a 3 phase inverter. The installer knew I had 3 phase as they had to order in a 3 phase smart meter. They also stated that the wire from the inverter to the main switch board was too small for the size of the system. I contacted the installer but have got no reply after 3 weeks. I am now going to install a Fronius 3 phase inverter and hope to seell my 12 month old one. Am I doing the right thing. Hi, Lindsay, yes it's a firmware upgrade - but you would also need us to change your settings as it is password protected. Hi, Aaron, it requires a firmware upgrade and requires an installer to adjust the settings (because it is password protected). Cool, would that include the Primo? is it a firmware upgrade or somesuch? Hi Mark, thank you for the interesting article. With energex's 0.9 power factor turning a 5kw inverter into a 4.5kw one, would clipping starting eating into the output gained from using 6.5w panels over 5.4w panels? Hi Harmz. 10kWh is small consumption! It depends on what your expectations are and what your tariffs are. In the Brisbane area, If you installed a 5kW system and get a high feed-in tariff (12-14 cents), you may see a return on your investment may be 6 years or so. I have a heat pump for hot water, household has two people who both work lots so not home all that much in the day, but home most nights. Wood heater on very cold nights in winter and air cons on very hot nights in summer. Last bill (17 Feb 2017 - 22 May 2017 (95 days)) showed an Average daily usage of 11.01 kWh, Same time last year was 10.51 kWh. Candidate for solar and large system or nah?